Joe Biden Offered 'Expressions Of Affection' But Denies Inappropriate Behavior The former vice president and likely presidential candidate said he does not believe he acted inappropriately. "If it is suggested I did so, I will listen respectfully," Biden said in a statement. Then-Democratic candidate for lieutenant governor Lucy Flores and then-Vice President Joe Biden at a rally on Nov. 1, 2014 in Las Vegas. Flores accuses Biden of acting inappropriately during that visit. "In many years on the campaign trail and in public life, I have offered countless handshakes, hugs, expressions of affection, support and comfort. And not once — never — did I believe I acted inappropriately. If it is suggested I did so, I will listen respectfully," Biden said in a statement released by his spokesman on Twitter. Biden's remarks come two days after Lucy Flores, who was running for lieutenant governor at the time of the alleged incident, published an essay about it in New York magazine, and hours before she was set to make several interview appearances on Sunday, including a conversation with NPR's All Things Considered. Speaking with Korva Coleman, Flores reiterated that she decided to step forward despite inevitable backlash from Biden supporters, who, at best, have suggested she dismiss the "awkward" exchange as a generational misunderstanding, and at worst, accuse her of sabotaging one of the party's most viable presidential candidates, because "this type of behavior has to be taken seriously." 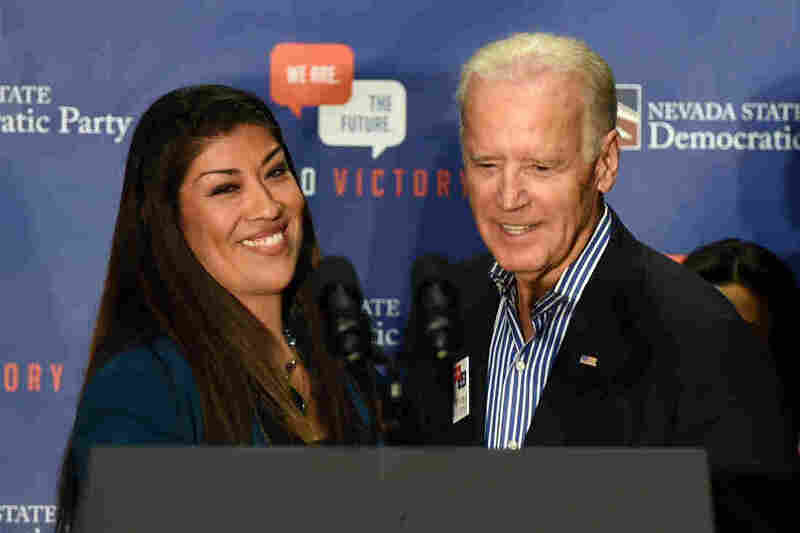 Former Vice President Joe Biden, pictured on March 26, said he does not believe he acted inappropriately with Lucy Flores at a campaign event in 2014. "I need the vice president and all men, and all people who are in positions of power to understand that in that setting ... that kind of behavior is absolutely inappropriate," Flores, who has also worked for Sen. Bernie Sanders' political organization, said. In the essay, Flores wrote she was "grateful and flattered" when she learned Biden would help boost voter turnout on her behalf at a campaign rally in Las Vegas in 2014. But her enthusiasm morphed into mortification, when moments before going on stage, he walked up behind her, put his hands on her shoulders, took a deep whiff of her hair and planted a lingering kiss on the back of her head. "A big part of the reason that I'm speaking up now is because he has a history of this; this is not an unknown issue. There have been stories, there are pictures, there are videos" chronicling instances in which Biden appears to have invaded women's personal space over many years, she said. "If he looks at all of that and still says to himself, 'I don't believe that I was acting inappropriately,' I think that there is a very severe disconnect and lack of empathy for what the women on the receiving end are feeling," Flores added. In his statement, Biden indicated his recollection of the meeting greatly differs from Flores'. "I may not recall these moments the same way, and I may be surprised at what I hear," Biden said. "But we have arrived at an important time when women feel they can and should relate their experiences, and men should pay attention. And I will." The 76-year-old, who's close to making a decision about running for president, added that he will continue working as an advocate for women's rights. 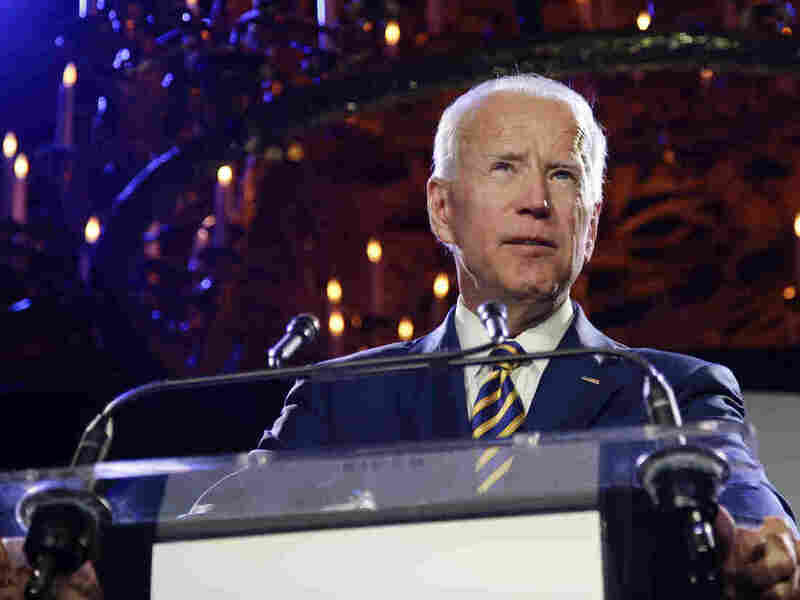 "I will fight to build on the work I've done in my career to end violence against women and ensure women are treated with the equality they deserve," Biden said. "I will continue to surround myself with trusted women advisers who challenge me to see different perspectives than my own. And I will continue to speak out on these vitally-important issues where there is much more progress to be made and crucial fights that must be waged and won." The statement is the first direct response from Biden to the accusations. Earlier statements came from Russo, who previously said Biden had no memory of the alleged kiss and was unaware that he had made Flores feel uncomfortable. The organizer of the 2014 event where Flores and Biden met disputed Flores' account. Henry Munoz, who leads the Latino Victory Project said, "at no time were these two leaders alone together and I, and the organization I co-founded and those in attendance, do not believe that circumstances support allegations that such an event took place." Flores, who never asserted she and Biden spent any time alone, said she found Munoz' statement "nonsensical." She was also critical of the media for underplaying the gravity of such episodes involving Biden specifically, as well as several other male politicians. "It was just completely being glossed over," Flores said. In instances when Biden's actions were deemed newsworthy, she said, "they'd talk about it jokingly and kind of giving him a pass." "Well, I'm saying no," she said. "Culture is changing and it's changing for the better. This is about women having agency over our own bodies, our personal space. ... What was appropriate 50 years ago, what was appropriate 30 years ago, is no longer appropriate and women are speaking out about it and we are saying, 'Enough is enough.' "